As a beef producer, you are asked to be an economist, nutritionist, range scientist, mechanic, and the list goes on. While these skill sets are needed to run a successful operation, it can be a daunting task to stay well versed in all of these areas. As a result, many producers experience “information overload” and begin overlooking very useful tools. In the genetic world, scientists, breed associations and those who conduct routine genetic evaluations have provided a plethora of genetic tools for producers to use when making progressive changes within their operation. Below are what I believe to be the top three misunderstood and underutilized genetic tools available to beef producers. Yes, that’s correct. In 2017, we are still talking about a subject that has been well documented over the past century – yet it is underutilized and, in many cases, not executed correctly. Planned crossbreeding systems don’t need to be overwhelmingly complex. Hybrid bulls offer an easy way for producers without the resources to conduct rotational crossbreeding systems to benefit from heterosis and breed complementarity. Crossbred cows are key, and for smaller commercial cow-calf operations, purchasing crossbred replacement females (maybe bred with their second or third calf) and breeding them to terminal sires offers a very simplistic way to benefit from heterosis. Doing so will not only help producers avoid the pains of heifer development and night calving, but it will also help shorten the list of traits that are critical when selecting herd sires. 1943 was the year the first peer-reviewed journal article was published on this subject. Close to 60 years later, the first major beef breed organization published an economic index. Producers know more than one trait contributes to profit at the enterprise level. Clearly, the profitability of a cow-calf producer who sells calves at weaning and retains replacement heifers depends on more than just the average weaning weight of calves sold. Overall profitability for this particular enterprise would also depend on the fertility and maintenance energy requirements of the future cows being retained. In order to select for all of these traits (weaning weight, milk, mature cow weight, heifer pregnancy, cow sustained fertility) simultaneously, economic indices are the best tool. In the simplest form, economic indices are the preferred tool for multiple trait selection. A bio-economic index is simply a collection of expected progeny differences (EPDs) relevant to a particular set of breeding goals where each EPD is multiplied and weighted by their respective economic value. Consequently, a high index value does not necessarily mean an animal excels in all EPD categories. Superiority in a trait can compensate for inferiority in other traits, depending on how the EPDs are weighted in the index. A high index can excel in genetic potential for profit – making it critical for producers to correctly identify their breeding goals. For example, the use of an index such as the American Angus Association’s Dollar Beef ($B) on a ranch that retains replacement heifers can lead to adverse effects, given that $B places emphasis on traits such as carcass weight, marbling and yield grade (fat and ribeye area). Selection to increase carcass weight could lead to an increase in the mature weight of replacement females. Even among selection indices, some are more understood than others. In another example, Angus $EN is designed to place selection pressure on cow costs. Selection for increased $EN will result in cows that are less expensive to maintain due to maintenance costs associated with mature cow size and lactation potential. Reducing input costs should receive more attention industry-wide. For those who retain replacement heifers and sell calves, there are indices that target that set of traits critical to these goals (e.g., $W (Angus), API (Simmental), BMI (Hereford), $M (Beefmaster), to name only a few). Where should I begin? If you are a commercial producer, then the fundamentals are still in place: Use EPDs and selection indices in your sire selection decisions. The benefit of genomics is that genomic-enhanced EPDs will have higher accuracy values, especially when considering yearling bulls. This means commercial producers can purchase yearling bulls with levels of accuracy similar to that of sires that have already produced several calves. This ability to mitigate the risk of choosing the wrong bull is very valuable. For seedstock producers, there is more they need to understand. Depending on the trait, these tests explain only a fraction of the genetic differences between animals (anywhere between 9 and 50 percent of the genetic variation – approximately). That is why this information is combined with traditional EPDs – to increase the accuracy of the EPD of unproven animals at an earlier age. That is also why producers shouldn’t rely only on the results of a genomic test; it doesn’t tell the entire story. Likewise, it is important that all animals within a contemporary group are tested, not just what is perceived to be the best. Ideally, a seedstock producer should use this information to determine which bulls should make the sale, ensuring only the “best” are offered to commercial customers. Testing after the sale list has been decided does little good in this regard. Relative to items 2 and 3, there is room for improvement. To improve what are already very useful tools, the industry needs continued collection of phenotypes. The advent of genomic selection does not mean the routine collection of phenotypes (weights, fertility measures, carcass attributes, etc.) can be neglected. There needs to be a concerted effort among all segments of the beef industry to collect economically relevant traits that are sparsely collected (if at all) in the seedstock sector. 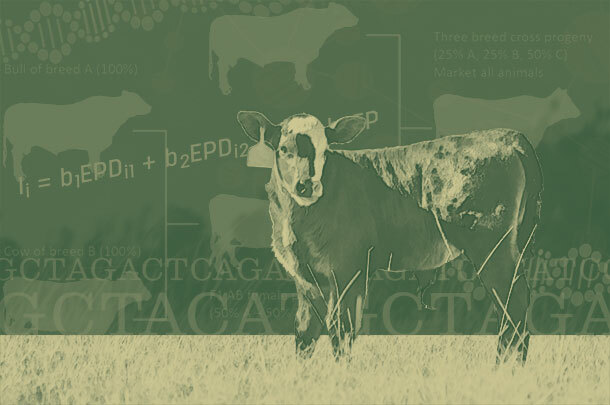 Traits such as carcass attributes, fertility and disease-related phenotypes are collected every day in the commercial industry (cow-calf, feedlot, packer). If these phenotypes could be assembled and leveraged, the beef industry would have enhanced capability to practice genetic selection for industry-wide profit. Meanwhile, seedstock producers can make progress by routinely collecting and reporting breeding contemporary groups, calving events, reasons for culling and mature weights (and associated body condition scores); these allow for more fertility and cow efficiency-related EPDs. The beef industry cannot afford to underutilize proven technology. Although improvements can and will be made in these tools, our protein resource competitors continue to take advantage of genetic selection principles, while we all too often do not.